IDP women in one of the camps in Maiduguri, Borno State, Nigeria, collect their share of stock cubes to prepare the day's meal. The women are paid a salary to cook the meals. Humanitarian convoys have uncovered emergency levels of severe acute malnutrition and famine-like conditions in Nigeria's Borno state, particularly in 15 satellite camps, where some 275,000 people are living, the United Nations relief aid wing has warned. According to a report from the UN Office for the Coordination of Humanitarian Affairs (OCHA), these camps are in hard-to-reach, insecure areas, many of them still in locations of active conflict. Humanitarian actors are working with the Government to provide the immediately required assistance. The UN Children's Fund (UNICEF) and partners in newly accessible areas in Borno state have reported alarming levels of severe acute malnutrition. On 27 June, the Government declared a food and nutrition emergency in the state, and a UN fund that supports rapid humanitarian responses, known as the Central Emergency Response Fund (CERF), disbursed $13 million to provide life-saving assistance to 250,000 people in the conflict-hit northeastern region. The situation in the Lake Chad Basin has been the subject of discussions at regional dialogues and at the UN Headquarters. Around 3.8 million people are currently facing severe food insecurity across the Basin, where the lean season has now set in in many parts. The conflict has aggravated the effects of erratic rainfall and other environmental factors that hamper good food production. Those forced to flee their homes are among the worst-affected by the rising food shortages. A regional protection dialogue, held in Abuja, Nigeria, from 6 to 8 June, brought together participants from the Governments of Cameroon, Chad, Niger and Nigeria, international and regional organizations, donor governments and civil society. The Governments agreed on measures to provide better protection and assistance to populations of the Lake Chad Basin, in particular to refugees and internally displaced persons. During the Humanitarian Affairs Segment of the UN Economic and Social Council (ECOSOC), a dedicated side-event on the Lake Chad Basin, titled “Ending Needs in the Lake Chad Basin”, explored how best to achieve collective outcomes for people affected by the crisis. In Chad, improved security has allowed humanitarian actors to accelerate delivery of assistance in previously hard-to reach areas in the western and northern parts of the Lac region. The CERF has approved $10 million to respond to the humanitarian crisis in the Lac region and food insecurity in the Sahel regions. However, malnutrition rates in Chad are alarming, with preliminary results of a screening conducted in June by the World Food Programme (WFP) on 11 sites showing 33 per cent of moderate acute malnutrition and 11.5 per cent of severe acute malnutrition among children under two - well above emergency thresholds. From 1 to 15 June, WFP provided assistance to over 37,000 displaced people in these 11 sites, and 3,200 children received a malnutrition prevention ration. Boko Haram insurgents have mounted several attacks in recent weeks, displacing tens of thousands of people in the conflict-hit regions of the Lake Chad Basin. In Bosso area in the south-east of Niger, attacks displaced some 70,000 people. Assistance is being provided in the various sites where the displaced have settled. 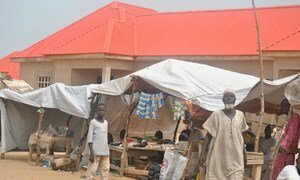 The top United Nations relief official today released $13 million from a fund that supports rapid humanitarian responses – known as the UN Central Emergency Response Fund (CERF) – to provide life-saving assistance to 250,000 people in areas of north-east Nigeria that have just become accessible.